Designed for Line Of Sight (LOS) communications between 115 and 400 MHz in either FM or AM modes. There are optional frequency bands of 30 - 90 MHz Tactical FM and 400 - 420 MHz FM. 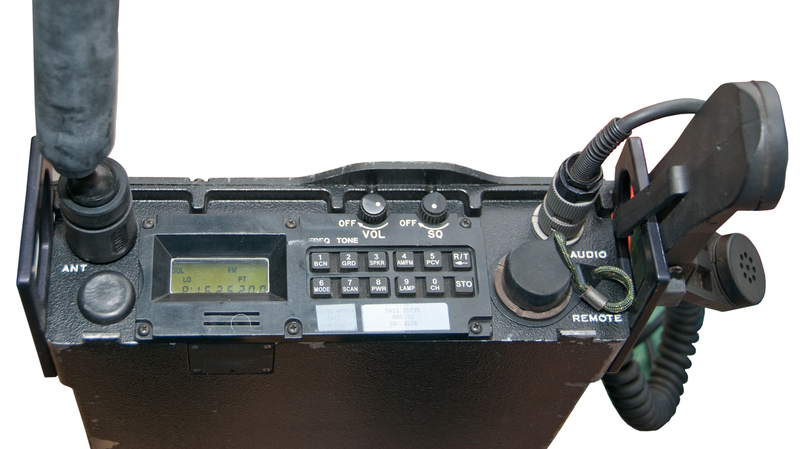 designed to replace the URC-100 series radios which covered some combination of VHF low band tactical FM, VHF high band aircraft AM and UHF aircraft AM. Made by Motorola for Line Of Sight (Wiki: LOS) applications such as ground <-> air communications. Private Line (Wiki: CTCSS) tones, like used for amateur radio repeaters are available only when the UPL-100 option is installed. The option is unobtainable. I think you can not use a PL tone generator on a microphone because the audio circuitry will not pass the low frequencies, so it must be done either using the REMOTE connector or by mounting the tone generator inside the box and wiring it into the cipher text audio. The audio connector has a not squelch output on pin F (see: U-229 Pin Out) so that a repeater or re-transmission setup can be easily made. Each battery plug (for BA-5590 type batteries) is wired to put both halves in series so they deliver 24 Volts. For testing I used the WKW-7 Power Adapter because my BB-2590 was low on charge. Pressing <Mode> then <PWR> starts the metering function where Rx signal strength or Tx power is shown. Then pressing <R/T> brings up the internal power supply voltage for the +5 supply. X-mode J2, Connects radio to peripheral devices such as COMSEC equipment, remote control unit and test equipment. The remote uses RS-232 with ASCII characters. Remote data: ACK/NAK (HT: New acknowledge) codes in manual. Radios - military, ham, civilian, &Etc. This is a Combined Synopsis/Request for Quotation for Commercial Supplies/Services prepared in accordance with the format in FAR 12.6, as supplemented with additional information included in this Notice. This announcement constitutes the only Request For Quotations and incorporates Provisions and Clauses IAW the FAR/DFAR. This is a SOLE SOURCE PROCUREMENT to General Dynamics Decision Systems Inc.